Financial services firms everywhere would certainly love to know, as they scramble to find ways to win the potentially massive business of the upcoming generation of financial consumers. We know that younger adults are beginning to acquire wealth, either by inheriting it from their parents or grandparents, or by building their own portfolios. And with today’s new technology channels, these generations that have grown up digital will certainly leverage technology to help with the crucial investment decisions now facing them. My firm, Simon Associates Management Consultants, recently conducted ethnographic research among members of Gen X and Gen Y. We found that consumers did not necessarily want high-tech solutions in isolation, but just as important, they do want support, advice and more knowledgeable people speaking to them than they currently experience in their banking interactions. Unfortunately, if banks do not understand how to attract, service and create the right teams internally, as well as develop the appropriate technology solutions, these Gen X and Y consumers will assuredly take their wealth to institutions where they feel appreciated and understood—most probably community banks that offer investment services that adhere to the principles of their longstanding, relationship-based business models. Failing to comprehend the financial needs of future customers. To understand better how Gen Xers and Gen Yers think about their emerging wealth and core financial concerns, we asked a dozen middle-income consumers, mostly between the ages of 35 to 50, to envision an imaginary future bank that would best serve their personal financial and investment needs. Everyone in the group had investable, liquid assets of more than $500,000. To help these consumers articulate their vision for the preeminent bank of the future, we used very specific problem-solving games and collaborative play to tap into new, innovative thinking. 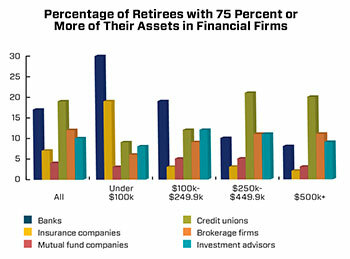 What did the Gen X and Gen Y consumers envision from their financial providers? One theme that kept emerging from the conversations was that banking is still a people-to-people business, and that what these younger people wanted most was someone to guide them through their life transitions—from earning money to saving it, investing it, inheriting it and, finally, enjoying it, all the while having peace of mind that someone they could trust was guiding them and watching over their finances. In addition to having liquid assets of at least $500,000, these younger consumers had jobs and were doing reasonably well managing their budgets and lifestyles. As they each spoke about their “Better Bank Box,” it became clear that the challenges of managing money are not getting easier. a guide that could help them design a sound budget and a workable plan for an uncertain future. 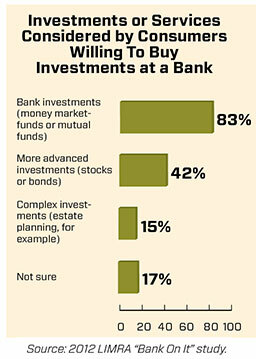 Perhaps most significantly for community banks with personal wealth management programs, this generation of investors is far more willing to buy an investment product from a bank—75 percent compared with 63 percent of baby boomers, according to the 2012 LIMRA “Bank On It” consumer study. A similar pattern emerges when asked about buying life insurance. All this research, of course, is very good news to relationship-based community banks that develop retail investment programs, while continuing to fulfill the best services that their institutions have always provided to consumers.